Styled by Sixten Sason, the Saab 93 was a radical redesign of the Saab 92, and featured a new transmission and tubeless tyres. 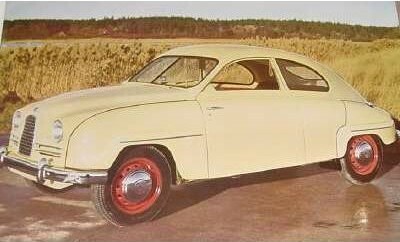 It was fitted with a longitudinally mounted three-cylinder two-stroke engine, and became the first Saab to be exported outside of Sweden, with most exports going to the United States. The 748cc engine delivered 33 bhp, which was increased to 38 bhp for the 93B model of September 1957. 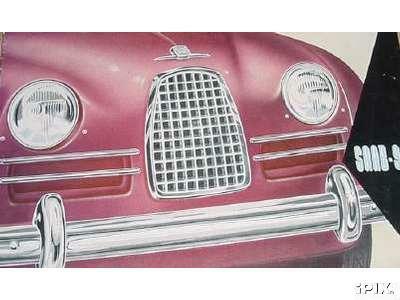 Two-point seatbelts were introduced as an option, and the two-piece windshield was replaced by a single piece of glass. The car gave Saab its first taste of motor sport success when Erik Carlsson won both the Finnish and Swedish Rallies in his modified 65 bhp Saab 93. 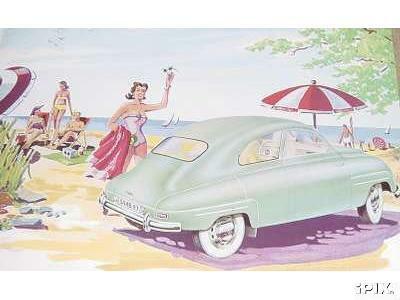 This model was, in essence, a considerably trimmed Saab 93, and was launched at the 1958 New York Motorshow. It was the first production-built Saab sports car and the first car to have factory fitted seatbelts as standard – something we simply take for granted today! SAAB Press Release, September 3, 1957. There are many important innovations on the new model of Saab-93 now put on the market. The most striking feature of the Saab-93B, as the new model is called, is the undivided. arched wind-screen enclosed by an elegant metal. In conjunction with the new windscreen, there are improved wind-screen wipers, which have a considerably expanded cleaning surface. A three-position, vertically adjustable back seat is an advancement that many will appreciate. In the highest position even the small children get a good view. Double-acting door stops prevent the doors from closing as passengers enter. The doors also have an American type safety-lock, which keeps them from springing open if the door becomes deformed. Attachments for safety-belts are now standard. Further, the hand brake lever has been raised 10 cm to make it more convenient to reach. Another feature of the car is a self-mixing petrol tank, and in addition it is now possible to reduce the oil admixture in the petrol to 3 % or 1 l. oil to 33 l. petrol. The Saab-93B is also equipped with blinkers.